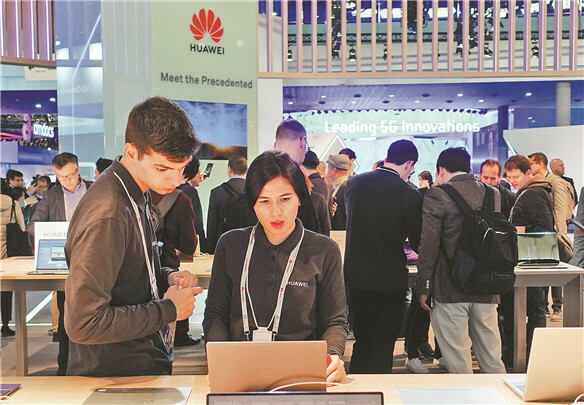 A string of Shenzhen-developed 5G products stood out among global giants in the field at the 2019 Mobile World Congress (MWC) in Barcelona, Spain, on Monday, the Shenzhen Special Zone Daily reported. The advanced products and industrial chains by Shenzhen showcased at the MWC demonstrated the trends and potential market occupiers in the global 5G market in the next three to five years, the report said. According to the report, most of the 5G products and equipment developed by Shenzhen enterprises can be put into commercial use immediately. Huawei and ZTE have launched a whole range of 5G products, from mobile phones to computer network devices, which not only demonstrates their leading edge in the field but also unveils a 5G map for the telecommunications industry, the report said. On the eve of the MWC, Huawei unveiled its foldable 5G-enabled phone, HUAWEI Mate X, with a download speed of up to 4.6 Gbps theoretically. The Mate X’s screen measures 8 inches diagonally when unfolded to serve as a tablet. Huawei also revealed its 5G CPE Pro, said to be the smallest CPE with a speed 21 times faster than a 4G network. This means it takes only three seconds to download an HD movie. All these devices are equipped with a chip named Balong 5000, developed independently by Huawei. It is believed to have the highest integration level and the best performance currently available on the market. Many experts in the industry have suggested that the launch of 5G CPE Pro means 5G technology is mature for devices and its application will also be a key driver in the commercial success of 5G technology. The other Shenzhen company, ZTE, joined hands with Qualcomm to unveil its 5G-enabled phone, Axon 10pro. A range of ZTE products, including a self-developed third-generation base station, RF chip, processing unit for an active antenna and multi-mode baseband, also made debuts. The processing unit for a multi-mode baseband is the strongest in dealing with 2G, 3G, 4G and 5G technologies and has the most interfaces, according to the report. Xu Ziyang, chairman of ZTE, said they have so far established 5G collaboration with over 30 operators around the world to meet their needs in deploying a 5G network. Two other Shenzhen brands, TCL and Nubia, also unveiled foldable mobile phones. Behind these products is the support of advanced technologies and equipment units from a group of Shenzhen firms, for example, a flexible folding screen developed by CSOT and silver nanowire by HUAKE TEK.